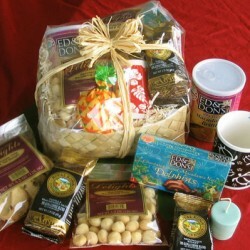 Hawaiian gift baskets for The Soul of a Woman. 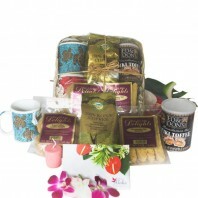 This is a spa gift basket that features our Soul of a Woman natural products. 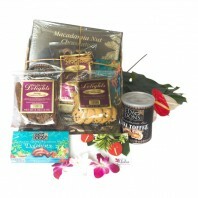 The wild Hawaiian flowers of mango, lehua, fragrant white ginger, and banana are used. 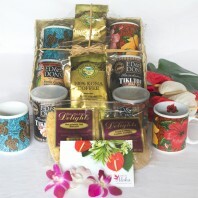 All have been carefully gathered in the rain forests of Hawaii to create the Soul Of A Woman Flower Essence Formula. Lightly scented with neroli and coconut oils. Bath crystals are a favorite for those who like to relax or maybe indulge a bit. 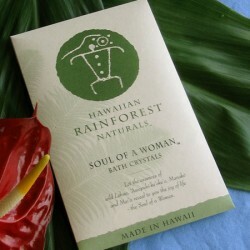 Soul of a Woman formula crystals include natural Hawaiian essences. All natural with no chemicals. Also makes a nice foot bath by using less of the package. Soul of a Woman Body Lotion can be used all over. It is made with the same local flowers. Orange blossoms and coconut add a natural fragrance. This lotion will relax and refreshen the skin. The Soul of a Woman natural body mist is cooling and refreshing. Apply after a shower. It can also be used on bed linens or even in the air to energize a room. Soul of a Woman soap is made with coconut and glycerin. The formula is all natural. Each bar is a long lasting 4.25 ounces. Add an artificial plumeria hair pick for a way to brighten up any hair style. Worn in the spirit of ‘aloha’ this pick features a white plumeria design with a soft yellow center. Finally to enhance the home spa experience we’ve included a candle. 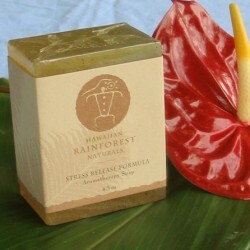 All of our Hawaiian candles are poured by hand. 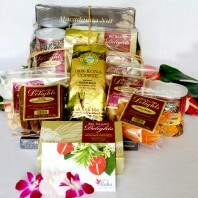 Each is infused with a natural flower essence or fragrance from the islands. They are all natural being made of soy. They burn eight to ten hours with a warm and fragrant glow. 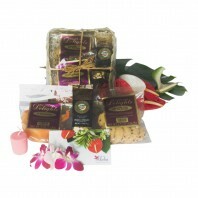 Creatively arranged in a hand woven dried lauhala basket wrapped in cello and tied with decorative raffia. 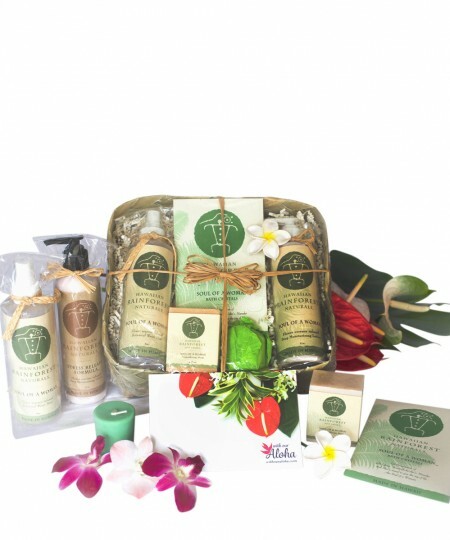 Spa items are naturally infused with flowers from the Hawaiian rain forests.